one of the small bonelike structures of the jaws for biting and mastication of food; they also help in the shaping of sounds and forming of words in speech. Structure. The portion of a tooth that rises above the gum is the crown; the portion below is the root. The crown is covered by enamel, which is related to the epithelial tissue of the skin and is the hardest substance in the human body. The surface of the root is composed of a bonelike tissue called cementum. Underneath the surface enamel and cementum is a substance called dentin, which makes up the main body of the tooth. Within the dentin, in a space in the center of the tooth, is the dental pulp, a soft, sensitive tissue that contains nerves and blood and lymph vessels. The cementum, dentin, and pulp are formed from connective tissue. Covering the root of the tooth and holding it in place in its alveolus (socket) in the jaw is a fibrous connective tissue called the periodontium. Its many strong fibers are embedded in the cementum and also the wall of the tooth socket. The periodontium not only helps hold the tooth in place but also acts to cushion it against the pressure caused by biting and chewing. There are 20 primary teeth, called also deciduous teeth, baby teeth, or milk teeth, which are eventually replaced by 32 permanent teeth, evenly divided between the upper and lower jaws. Teeth have different shapes because they have different functions. The incisors, in the front of the mouth, are shaped like a cone with a sharp flattened end, and cut the food. There are eight deciduous and permanent incisors, four upper and four lower. The canines (or cuspids) are at the corners of the mouth and are shaped like simple cones; they tear and shred food. There are four permanent canines; the two in the upper jaw are popularly known as the “eye teeth.” The premolars (or bicuspids) are next behind the cuspids and consist of two cones, or cusps, fused together; they tear, crush, and grind the food. There are eight permanent premolars. The molars are in the back of the mouth; they have between three and five cusps each, and their function is to crush and grind food. There are 12 permanent molars in all, three on each side of both the upper and lower jaw. The hindmost molar in each of these groups, and the last one to emerge, is popularly known as the wisdom tooth. Development and Eruption. Both the primary teeth and the permanent teeth begin to develop before birth. Because of this, it is vitally important that expectant mothers receive foods that will supply the calcium, phosphorus, and vitamins necessary for healthy teeth. The primary teeth begin to form about the sixth week of prenatal life, with calcification beginning about the sixteenth week. A considerable part of the crowns of these teeth is formed by the time the child is born. Eruption, or cutting of teeth, is slower in some children than others, but the primary teeth generally begin to appear when the infant is between 6 and 9 months of age, and the process is completed by the age of 2 to 2½ years. When the child is about 6, the first permanent molar comes in just behind the second molar of the primary teeth. About the same time, shedding of primary teeth begins. The permanent teeth form in the jaw even before the primary ones have erupted, with the incisors and the canines beginning to calcify during the first 6 months of life. Calcification of the others takes place shortly after. As the adult teeth calcify, the roots of the primary ones gradually disappear, or resorb, and are completely gone by the time the permanent teeth are ready to appear. Occasionally a primary tooth root does not resorb, and as a result the permanent tooth comes in outside its proper position. When this happens, it is necessary to remove the primary tooth and root. The first teeth to be shed, about the sixth year, are the central incisors. The permanent incisors erupt shortly afterward. The lateral incisors are lost and replaced during the seventh to ninth years, and the canines in the ninth to twelfth years. The first premolars generally appear between the ages of 10 and 12, the second molars between 11 and 13, and the third molars, or wisdom teeth, between 17 and 22. It is not uncommon for the third molars to fail to erupt. Occasionally there is a partial or total lack of either the primary or the permanent teeth (anodontia). In some cases this is inherited, and in others it may be related to endocrine gland disturbances. Tooth Decay and Its Prevention. Tooth decay, or dental caries, is the most common disease in the United States. It begins on the outside of the teeth in the enamel as bacteria and refined carbohydrates adhere to the tooth surface to form plaque. The action of the bacteria on starchy and sugary foods produces lactic acid, which is believed to dissolve the enamel. Once there is a break in the enamel (demineralization), the decaying process moves on into the dentin and then to the pulp, attacking the nerves and causing toothache. For methods of treatment and prevention, see dental caries. accessional teeth the permanent molars, so called because they have no primary tooth predecessors in the dental arch. See also succedaneous teeth. anterior teeth the teeth in the anterior parts of the dental arches; the incisors and canines. avulsed tooth a tooth that has been traumatically dislocated, usually salvageable for a reimplantation if appropriate treatment is initiated promptly. Prior to treatment the tooth can be placed in the conscious patient's mouth or in ice water or cold milk. No attempt should be made to cleanse the tooth. Hutchinson's teeth abnormal teeth seen in congenital syphilis, in which the permanent incisors have a screwdriver-like shape, sometimes associated with notching of the incisal edges. impacted tooth one so placed in the jaw that it is unable to erupt or to attain its normal position in occlusion. See also dental impaction. intruded tooth a tooth that has been forcefully pushed into the patient's gums and may appear to be absent; it will usually return to the normal position within one month. posterior teeth the teeth in the posterior parts of the dental arches; the premolars and molars. succedaneous teeth (successional teeth) the permanent teeth that have primary tooth predecessors in the dental arch. See also accessional teeth. wisdom tooth the third molar, the tooth most distal to the medial line on either side in each jaw; so called because it is the last of the permanent dentition to erupt, usually at the age of 17 to 21 years. Howard H., English neurologist, 1856-1925. See: Charcot-Marie-Tooth disease. One of the hard conic structures set in the alveoli of the upper and lower jaws, used in mastication and assisting in articulation. A tooth is a dermal structure composed of dentin and encased in cementum on the anatomic root and enamel on its anatomic crown. It consists of a root buried in the alveolus, a neck covered by the gum, and a crown, the exposed portion. 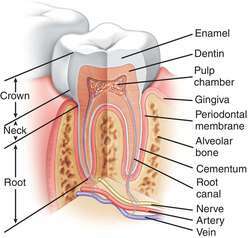 In the center is the pulp cavity filled with a connective tissue reticulum containing a jellylike substance (dental pulp) and blood vessels and nerves that enter through an aperature or aperatures at the apex of the root. The 20 deciduous teeth or primary teeth appear between the 6th-9th and the 24th months of life; these exfoliate and are replaced by the 32 permanent teeth appearing between the 5th-7th years and the 17th-23rd years. There are four kinds of teeth: incisor, canine, premolar, and molar. (tooth) pl. teeth one of the hard, calcified structures set in the alveolar processes of the jaws for the biting and mastication of food. Schematic cross section of an anterior (left) and a posterior (right) tooth in the maxilla. accessional teeth those having no deciduous predecessors: the permanent molars. artificial tooth one made of porcelain or other synthetic compound in imitation of a natural tooth. auditory teeth of Huschke toothlike projections in the cochlea. canine tooth , cuspid tooth the third tooth on either side from the midline in each jaw. Symbol C.
deciduous teeth primary teeth; the 20 teeth of the first dentition, which are shed and replaced by the permanent teeth. eye tooth a canine tooth of the upper jaw. Hutchinson's teeth notched, narrow-edged permanent incisors, sometimes but not always a sign of congenital syphilis. impacted tooth one prevented from erupting by a physical barrier. incisor tooth one of the four front teeth, two on each side of the midline, in each jaw. 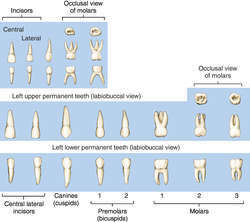 Symbol I.
molar tooth any of the posterior teeth on either side in each jaw, numbering three in the permanent dentition and two in the deciduous. Symbol M.
peg tooth , peg-shaped tooth a tooth whose sides converge or taper together incisally. permanent teeth the 32 teeth of the second dentition. premolar tooth bicuspid tooth; either of two permanent teeth found between the canine and molar teeth. Symbol P.
stomach tooth a canine tooth of the lower jaw. successional teeth the permanent teeth that have deciduous predecessors. wisdom tooth the last molar tooth on either side in each jaw. 1. One of a set of hard, bonelike structures in the mouths of humans and other vertebrate animals, usually attached to the jaw or rooted in sockets and typically composed of a core of soft pulp surrounded by a layer of hard dentin that is coated with cementum or enamel at the crown and used for biting or chewing food. 2. A similar hard projection in an invertebrate. 3. A projecting part resembling a tooth in shape or function, as on a comb, gear, or saw. any one of numerous dental structures that develop in the jaws. Although derived from modified bone, they are typically classified as part of the digestive system and are used to cut and grind food in the mouth for ingestion. Each tooth consists of a crown, which projects above the gum; two to four roots embedded in the alveolus; and a neck, which stretches between the crown and the root. Each tooth also contains a cavity filled with pulp, richly supplied with blood vessels and nerves that enter the cavity through a small aperture at the base of each root. The solid part of the tooth consists of dentin, enamel, and a thin layer of bone on the surface of the root. The dentin composes the bulk of the tooth. The enamel covers the exposed part of the crown. Two sets of teeth appear at different periods of life: the 20 primary teeth appear during infancy, the 32 secondary teeth during childhood and early adulthood. See also primary dentition, secondary dentition. One of the hard conic structures set in the alveoli of the upper and lower jaws, used in mastication and assisting in articulation. A tooth is a dermal structure composed of dentin and encased in cementum on the anatomic root and enamel on its anatomic crown. It consists of a root buried in the alveolus, a neck covered by the gum, and a crown, the exposed portion. In the center is the pulp cavity, filled with a connective tissue reticulum containing a jellylike substance, blood vessels, and nerves that enter through a canal at the apex of the root. The 20 deciduous teeth, or primary teeth, appear between the 6th and 9th through the 24th month of life; these exfoliate and are replaced by the 32 permanent teeth, appearing between the 5th and 7th years through the 17th to 23rd years. There are four kinds of teeth: incisor, canine, premolar, and molar. Synonym(s): dens (1) [TA] . Fig. 298 Tooth . Vertical section of a human molar. one of a series of structures found in the mouth of vertebrates associated with the biting, tearing and crushing of food. Each tooth is a hard structure consisting of a very hard external enamel layer of minerals bound by KERATIN. Underneath this is dentine which has a similar structure to the bone, but is harder, again due to mineral content. The dentine is perforated by fine channels containing processes of the odontoblasts (tooth cells). Centrally the pulp cavity contains blood capillaries and nerve endings. The root is covered by cement and embedded in the jaw bone. See Fig. 298 . 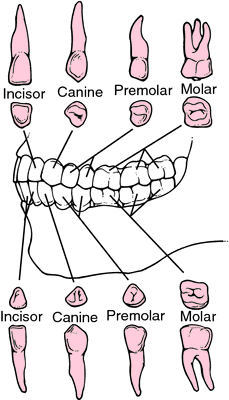 See INCISORS, CANINES, PREMOLARS and MOLARS. any structure with the general appearance of a tooth, such as a dogfish tooth (denticle) which is a modified scale. One of the hard conic structures set in alveoli of upper and lower jaws used in mastication and assisting in articulation; dermal structure composed of dentin and encased in cementum on anatomic root and enamel on anatomic crown. It consists of a root buried in the alveolus, a neck covered by gum, and a crown, the exposed portion. 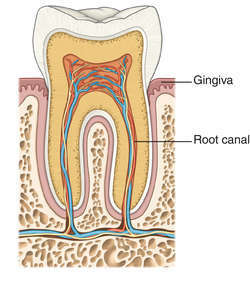 In the center, pulp cavity is filled with a connective tissue reticulum containing a jellylike substance (dental pulp) and blood vessels and nerves that enter through one or more apertures at the apex of the root. The 20 deciduous teeth or primary teeth appear between the 6th-9th and 24th months of life; these exfoliate and are replaced by 32 permanent teeth appearing between 5th-7th years and 17th-23rd years. There are four kinds of teeth: incisor, canine, premolar, and molar. n one of the hard bodies or processes usually protruding from and attached to the alveolar process of the maxillae and the mandible; designed for the mastication of food. n.pl the incisor or canine front teeth. n.pl the four canines; the third tooth located distal to the midline in any one of the four quadrants of the dentition. n See deciduous; tooth, primary. n.pl the medicaments used to treat hypersensitivity of the teeth. They should cause relatively little pain when applied; be easily applied, rapid in action, and permanently effective; and not discolor the teeth or unduly irritate the pulp. Substances used include 33% sodium fluoride in kaolin and glycerin, a 25% aqueous solution of strontium chloride, hot medicinal olive oil, and 0.9% solution of sodium silicofluoride. n the selective modification of tooth form and contour in the occlusal adjustment operation to eliminate occlusal interferences and establish tooth contours conducive to the health of the periodontium. See also bruxism. n.pl See hypoplasia, enamel, hereditary. n.pl primary teeth that erupt into the oral cavity during the neonatal period (from birth to 30 days). n See also polishing, coronal and polishing, selective. n.pl the maxillary and mandibular premolars and molars of the permanent dentition or the premolars and molars of prostheses. n.pl 1. term used by some in preference to deciduous teeth; however, it has not received the approval of preference by the American Dental Association. primary was suggested as a word “which may be acceptable to the dental profession, significant in its meaning, with no connotations of impermanence, and readily understood by nonprofessional people.” See also deciduous. n a painful pulpal response to external stimuli such as heat, cold, and sweet substances. The most common clinical finding is a hyperesthetic state of the root surface resulting from loss of a portion of the cemental covering with exposure of the dentin. See also hypersensitivity, dentin. n the action of moving a tooth mesially or distally out of contact with its neighboring tooth. n usually a full complement of maxillary and mandibular artificial teeth as they are carded by the manufacturer. n drifting apart of teeth accomplished over a long period, usually by the wedging action of a material such as gutta-percha, orthodontic wire, thread, or fibers in orthodontic therapy. n.pl the anatomic structures that function to maintain or aid in maintaining the teeth in position in their alveoli: the gingivae, cementum of the tooth, periodontal membrane, and alveolar and supporting bone. See also structures, supporting. n the staining of enamel and dentin of primary and permanent teeth during development with vital stains (e.g., with bile pigment in Rh incompatibility or with tetracyclines). n a tooth or teeth selected to support a prosthesis on the basis of the total surface areas of a healthy periodontium. n a tooth made of acrylic resin. n an artificial tooth that closely resembles the anatomic form of a natural unabraded tooth. 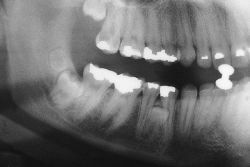 n abnormal calcification of the periodontal ligament resulting in abnormal fixation of a tooth. n a tooth fabricated for use as a substitute for a natural tooth in a prosthesis; usually made of porcelain or plastic. adj term used to describe a prosthesis or a part of a prosthesis that depends entirely on the abutment teeth for support. n the denture base restoring an edentulous area that has abutment teeth at each end for support. The tissue it covers is not used for support of the base. n.pl embryonic teeth formed during the fifth and sixth weeks of embryo development. See also odontogenesis. n the second stage in the development of a tooth in which cells continue to proliferate to form the cap of a tooth. n failure of morphologic development of the tooth germ found in ectodermal dysplasia and other disorders and occasionally found in normal children. n.pl the posterior teeth designed to permit the modified buccal cusps of the maxillary teeth to be positioned in the central fossae of the mandibular teeth. n.pl teeth designed without cuspal prominences on the masticatory surfaces. n a stain or change in color of a tooth, which can be caused by bloodborne pigment or blood decomposition within the pulp, usage of certain drugs, and trauma. See also tooth, pigmentation. n the migration of teeth from their normal positions in the dental arches as a result of such factors as loss of proximal support, loss of functional antagonists, occlusal traumatic tooth relationships, inflammatory and retrograde changes in the attachment apparatus, and oral habits. imbedded. See also tooth, impacted. n the process by which the tooth moves from its site of formation to its position of function. It can be active or passive. n a tooth that has been abnormally luxated from its alveolar support, commonly as a sequela to trauma. n a mythologic fairy said to leave small amounts of cash in exchange for a child's exfoliated primary tooth, which has been left under the pillow. n the axis of movement of a tooth when lateral forces are applied to the tooth. The fulcrum is considered to be at the middle third of the portion of the root embedded in the alveolus and thus moves apically as the bone resorbs in periodontal disease. n.pl two teeth united during development by the union of their tooth germs. The teeth may be joined by the enamel of their crowns, root dentin, or both. Usually consists of a single large crown. n the earliest evidence of a tooth. It includes the dental sac, dental papilla, and enamel organ. n teeth with bifid crowns and confluent root canals resulting from the division of the enamel organ during the developmental period. n.pr the defects of the permanent incisors associated with congenital syphilis. Dental hypoplasia affects primarily the incisors, canines, and first permanent molars. The incisors have a screwdriver or peg-shaped appearance. See also triad, Hutchinson. n a tooth that is painful when exposed to temperature changes, sweetness, or touch due to worn tooth enamel and, consequently, exposed dentin, usually near the cervix of the tooth. n a reduction in the amount of enamel formed, resulting in irregular pits and grooves of the enamel. n separation of teeth accomplished by the rapid wedging action of an appliance during restorative procedures. n a condition in which the unerupted or partially erupted tooth is positioned against another tooth, bone, or soft tissue so that complete eruption is unlikely. An impacted third molar tooth may be further described according to its position: buccoangular, distoangular, or vertical. An impacted maxillary canine tooth also may be further described according to its position: palatal (maxillary canine), lingual (mandibular canine), labial, or vertical. n the angle of slope of teeth from the vertical planes of reference. A tooth may be mesially, distally, lingually, buccally, or labially inclined. n the separation of a tooth from its investing and supporting structures as a result of normal exfoliation attending loss of primary dentition, exfoliation as a sequela to excessive bone resorption and periapical migration of the epithelial attachment in periodontal disease, and instrumentation for extraction necessitated by pathologic involvement of the dental pulp, periodontium, or periapical tissues. 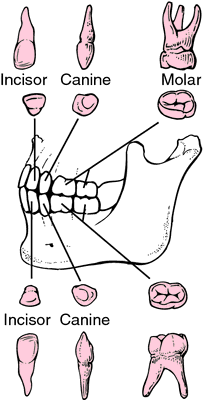 n migration of teeth toward the midline, occurring as a phenomenon associated with the action of the anterior component of force. Mesial migration of teeth occurs with the wear of their proximal surfaces resulting from the buccolingual movements of the teeth. n an artificial tooth, usually of acrylic resin, containing an inserted ribbon of metal, or a cutting blade, in its occlusal surface, with one edge of the blade exposed; sometimes used in removable dentures. n the movement of teeth into altered positions in relationship to the basal bone of the alveolar process and adjoining and opposing teeth as a result of loss of approximating or opposing teeth, occlusal interferences, habits, or inflammatory and dystrophic disease of the attaching and supporting structures of the teeth. n the absence of teeth from the dentition because of congenital factors, exfoliation, or extraction. n the movability of a tooth resulting from loss of all or a portion of its attachment and supportive apparatus. Seen in periodontitis, occlusal traumatism, and periodontosis. n the anatomic topography of the teeth. n.pl primary tooth found in the oral cavity at birth. n artificial teeth so designed that the occlusal surfaces are not copies from natural forms but are given forms that in the opinion of the designer seem more nearly to fulfill the requirements of mastication and tissue tolerance. n the graphing techniques used to chart a patient's primary and permanent teeth, as well as record any clinical and radiographic findings; the American Dental Association used the Universal Numbering System (numbering teeth 1 to 32). Other tooth numbering systems include the International Numbering System (a two-digit system) and the Palmer Numbering System (teeth numbered 1 to 8 in different quadrants). n intrinsic discoloration of a tooth, which can be caused by bloodborne pigment or blood decomposition within the pulp, usage of certain drugs, and trauma. n artificial teeth constructed of synthetic resins. n a tooth from which the dental pulp has been removed or is necrotic. n a tooth that has been inserted back into the alveolus after accidentally being displaced. n an altered position of the tooth in relation to the adjacent and opposing teeth and its basal alveolar process; in such an altered position the tooth has been turned on its long axis and is in a state of torsiversion. The result is an altered contact with adjacent teeth that produces a possible locus for food impaction between the teeth, with consequent gingival damage. n the arranging of teeth on a trial denture base; includes proper relation with occluding teeth. n a form of dentinal dysplasia characterized by large pulp chambers, meager coronal dentin, and usually no roots. n lack of proportional harmony in the width of various teeth, causing relative spacing and crowding in different parts of the dentition. n a tooth that has not erupted to the point of making contact with the opposing maxillary or mandibular tooth during mastication. Such a tooth may be immobile as a result of ankylosis to the mandible or maxilla. n a permanent tooth with primary predecessors (i.e., premolars, canines, and incisors). n extra erupted or unerupted teeth that resemble teeth of normal shape. n.pl an artificial replacement for natural teeth. n the portion of a narrow, infected sulcus that is adjacent to the surface of a tooth. n.pl artificial teeth constructed with a vertical, cylindric aperture extending from the center of the base into the body of the tooth into which a pin or cast post for the attachment of the tooth to a denture base may be placed. n.pr a permanent tooth showing hypoplasia resulting from injury or inflammation of the precedent primary tooth. n the erosion of a tooth by chemical or mechanical processes. n.pl prosthetic teeth having no cusp angles in relation to the horizontal plane; cuspless teeth. pl. teeth; one of the small, bonelike structures of the jaws for the biting and mastication of food. See also dental, teeth. Q. what exactly is a tooth fracture?A broken tooth? there is a tremendous amount of pain with this tooth. A. I had a temp that stayed on for a month because I couldn't mek it back to the dentist for a awhile. I used to have a Obsession with Jaw Breaker candy but with 2 crowns learned my lesson.